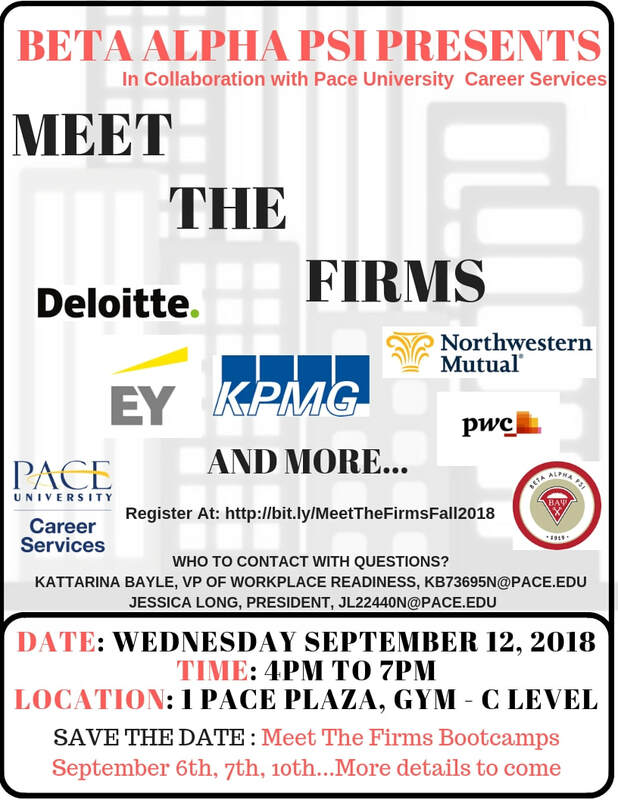 Meet the Firms is an annual event the Iota Lambda Chapter at Pace University hosts. The event features representatives from various accounting, finance, and CPA review firms. It is an excellent opportunity to meet with professionals, to show off your networking skills, and to find your potential career path. Our Meet the Firms event is limited to Beta Alpha Psi members and Pace University business majors. Therefore, this event is smaller, more intimate, and limited to firms representing the Accounting, Finance, and Information System industries. Some of the firms that have attended this event include: Deloitte, PWC, KPMG, EY, BDO, Baker Tilly, Marcum, UHY Advisors, Investors Bank, Northwestern Mutual, Roger CPA, Becker CPA, and NYSSCPA.